For the last 6 months, we’ve built the Proof Software with one singular focus in mind: Create something that dramatically increases conversions for our users. While we know that showing notifications of recent sales and opt-ins is a FANTASTIC way to build trust with your customers and quickly increase conversion rate, we’ve been experimenting with another cool conversion boosting feature. And after much testing on our own marketing funnels, we’re proud to release it to you. If you’ve been on the Proof homepage in the last month, you’ve probably seen a new kind of notification in the bottom left corner. By showing visitors the total number of visitors on our site, or the number of visitors looking at a current offer or page, we build credibility and conversions increase. This is especially powerful when a cart is about to close, or you have limited inventory or spaces available. “4 spots left” combined with “34 People Currently Viewing This Page” is an incredibly powerful combination to get people to take action. You’ll find the settings inside your Proof account under Notification Customizations. This is a feature we’ve seen huge brands such as Booking.com and Hotels.com use for a long time and we’re glad to finally bring it Proof users. One of the biggest complaints we got early on was that marketers couldn’t show Proof on the various URLs they wanted. You couldn’t grab emails from multiple order forms and then display those combined orders on your sales page. Well, we’ve finally solved that. Now, with our new notification setup flow with advanced URL matching, setting up Proof takes only a few clicks. 6. It’s also a lot easier to navigate around the app and get the information you need. Until now, your only options for images on your notifications image was to show the user’s social profile picture. With our newest update, you can now upload your own custom image to show in any notification. Our goal is to give our users more control and flexibility in how they display Proof on their websites. More control = more opportunity to increase conversions. In the past, sometimes our users might see a conversion popup on their page that said something like Yusuke from Tokyo, 03… That number is the zip code or region number in many countries around the world. We can handle these types of locations and from now on it should replace that region number with a country name. So it will now say: Yusuke from Tokyo, Japan! Proof was built for marketers, by marketers. We’re on a mission to bring transparency and honesty back to the internet by creating tools that increase conversion rate. Most conversion rate increasing tools are bad for the visitor. They are obnoxious, or flat out deceive visitors in order to get them to convert. At Proof, we believe there’s a better way. By proving to visitors that you are a real business, with real sales, real opt-ins, and real visitors. So far both users a visitors agree, adding social proof to your website works. 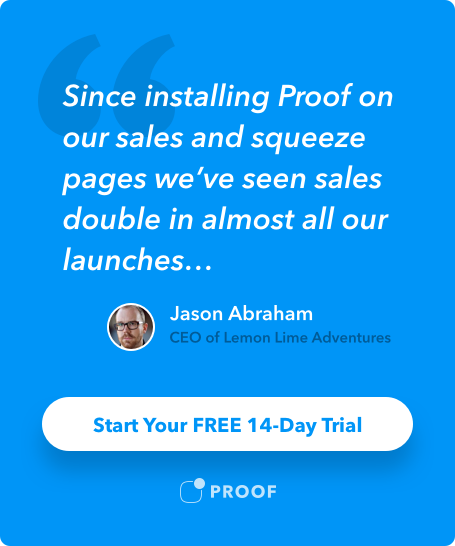 Sign up for a 14 day trial of Proof today and start seeing conversions increase within 24 hours!